Ok, GearWhores. Show us your kit. Post up information relevant about gear, relating to Close Quarters or tactical advantages if you can. I have to admit, I'm a Gear Newb and I have no idea when it comes to brands, models and the most basic information. Can someone explain the 'lines of gear'... and Issued vs Bought? Which explains it more, your thoughts? Anything to add? People say it's this model, type, brand of helmet. I see a HELMET! 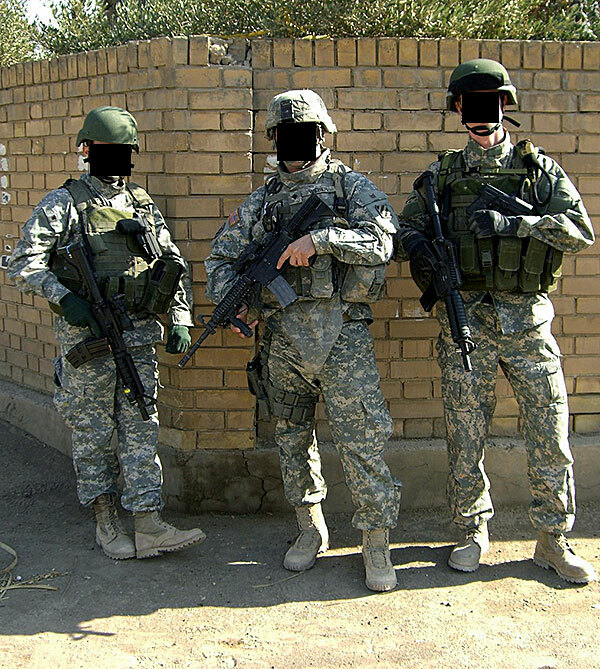 SAS to the left and right and an American in the middle,Iraq. 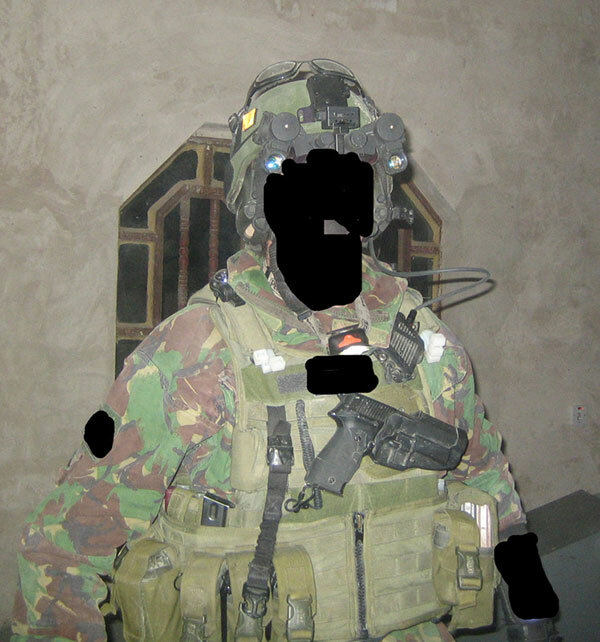 Sometimes the SAS wear US gear and uniform/battle dress due to the fact that they are working closely with them (FF issues). And full on kitted out for operations (esp CQB). Some wear relatively light loads in comparison to heavy - for roles and positions of course. Light may be used to gain full advantage on a rush. You even see this in the game America's Army 3 where you can choose light, standard or heavy loadouts and they affect weight, speed and starting time. Where should I start to begin my gear knowledge journey? There are simple tactical conscious things about gear too such as footwear not squeaking as you walk, etc. 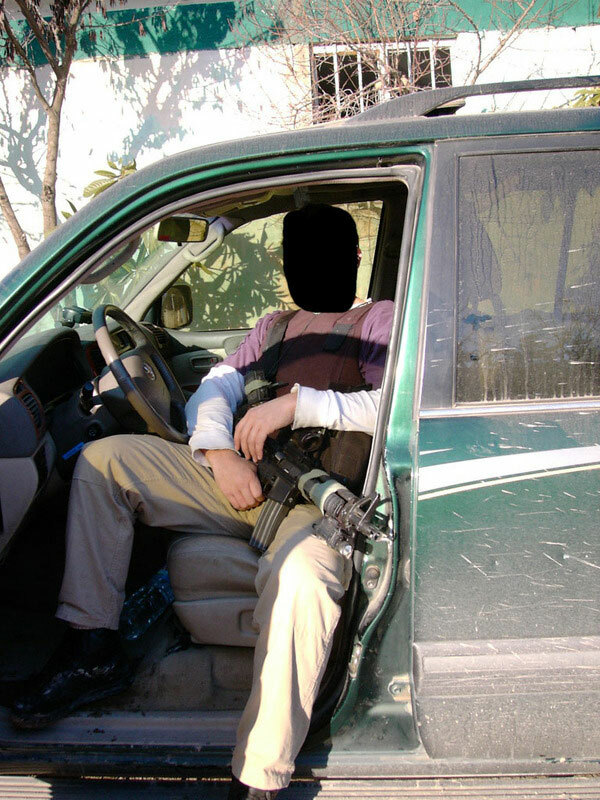 "One of my tactical rigs. It weighs 50 pounds. In the middle is my Blackhawk S.T.R.I.K.E. Cutaway Armor System. It is loaded with soft armor and rifle plates, festooned with magazines for pistol and rifle, a medical kit and a gas mask and pouch. The cutaway feature is invaluable for getting out of the armor in a hurry. Running for your life, falling in water or if, heaven forbid, you or one of you team mates are wounded and you have to get the armor off in a rush. This armor carrier distributes weight effectively making it the most comfortable I have ever worn. No armor carrier with armor and plates will ever be light but they can be comfortable. The duty belt is Blackhawk. The holster is a Safariland 6004 with the belt adapter making it ride higher and it is worn on the right side. The holster has a spare mag pouch (perfect for one hand only reloads) and a fixed blade ESEE-3 mounted to the shroud. On the back of the belt I have an S.O.E. “Compact Medical Pouch” and on the left an S.O.E. “CQB Subload”. A Surefire light and some spare pistol mags finish off the belt. That is my Spike's Tactical rifle. It has an 18 inch Lothar Walther stainless steel, fluted, 1/8 polygonal rifling,.223 Wylde chamber, mid-length gas system. The Spike's Tactical Dynacomp muzzle break ready for a Spike's Suppressor. The rail is a Spike's Tactical 13.2 S.A.R., with forged upper and lower receivers. Geisslle SSA 2 stage trigger, finished off with a Mag-Pul UBR stock. It has a Surefire Scout light on a Haley Strategic mount, and A.R.M.S. sling, an ACOG and Aimpoint with A.R.M.S. mounts." - James Yeager. Set up the operational requirements for your equipment. E.g: when will it be used; for how long will it be used; in what climate will I use this; how much do I need to carry and what are my options for re-supply etc. All factors play in and contribute to the final decision and the mission drives the gear train, as they say. Please also, feel free to post up pictures and discuss the relevant gear and use.